Decorate special events, LED faux light dinners with your loved one, Romantic and safe. Scatter some flameless LED Flickering Flameless lights around your home for a cozy ambiance. Excellent decor items for wedding receptions, dinner parties, holiday gatherings and other events. 4.Package include: Set of 6pcs LED light Candle(Batteries NOT included). 3.Each candle measures 6.5" H x 1" D; Each candle requires 2 AA batteries ( Not included ). 4.ADVANTAGE:Energy-saving, smoke-free, flameless LED lights, zero carbon emission,safe for kids, pets, seniors. 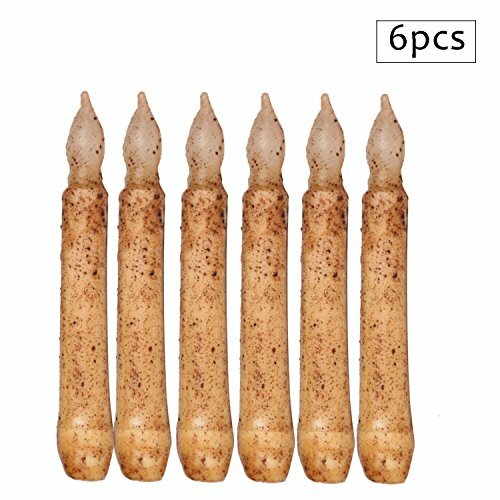 5.A rough textured wax coating and flame shaped tip offers a softly flickering candescent glow.Great for floral arrangements, weddings, home decor, churches, candle light vigils and more!